Arizonans often joke that whiskey is for drinking, water is for fighting. Water's value to the state was made evident by the 1934 "war" with California as well as by longstanding disputes with neighboring states over allocation of the Colorado River. The network of Phoenix-area canals was built over time to take advantage of every drop of water diverted to the desert. This network is larger than the network of canals in either Amsterdam or Venice! The Salt River Valley canal system began with the extensive irrigation projects dug by people we call the Hohokam. Their canals were rebuilt and extended in the nineteenth century by the Salt River Project (SRP). 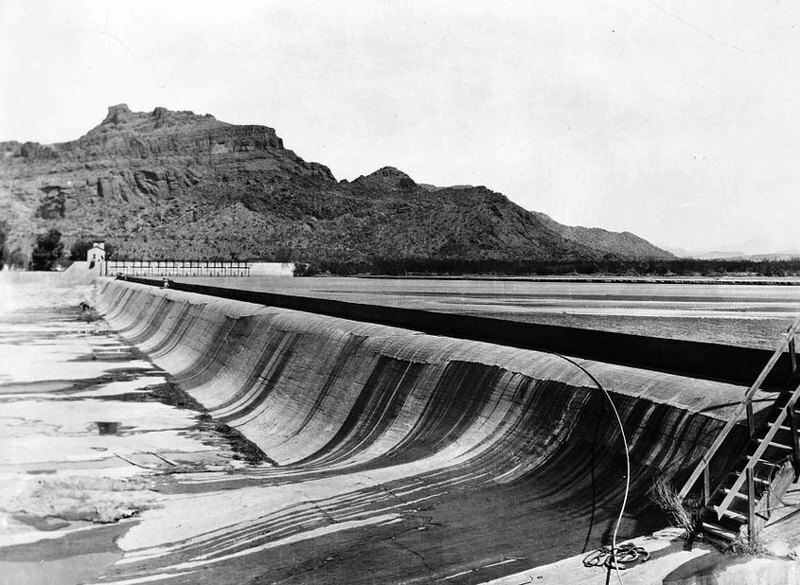 The Roosevelt Dam provided Arizona's first source of hydropower, used originally for its own construction and then for the wider Valley, setting in motion the "reclamation principle" of power as the paying partner of water. 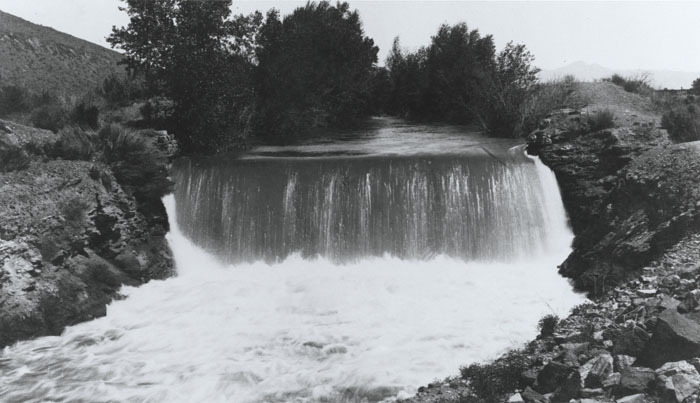 The hydropower at Arizona Falls also provided some of the Valley's first electricity. The water carried in the canals originates as snowpack in the mountains more than 60 miles east of Phoenix. The canals south of the Salt River were the first to be irrigated into verdant oases. The Arizona Canal, built 1883-1885, provided the lands north of the Salt River with water for cultivation, and the old and new Crosscut Canals tied the north and south canal systems together by 1913. The 1968 passage of the Colorado River Basin Project Act authorized construction of a 336-mile long Central Arizona Project canal system. The CAP canal diverts water from the state's western border to the Phoenix and Tucson areas and was completed in Phoenix in 1985 and in Tucson in 1993. 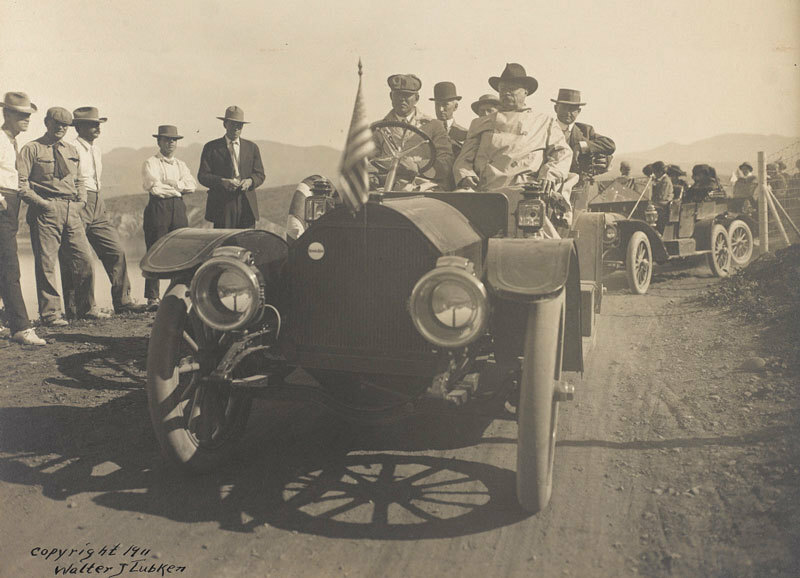 Theodore Roosevelt Speaking at the Dedication of the Roosevelt Dam in 1911. Courtesy of Library of Congress. Granite Reef Dam, ca. 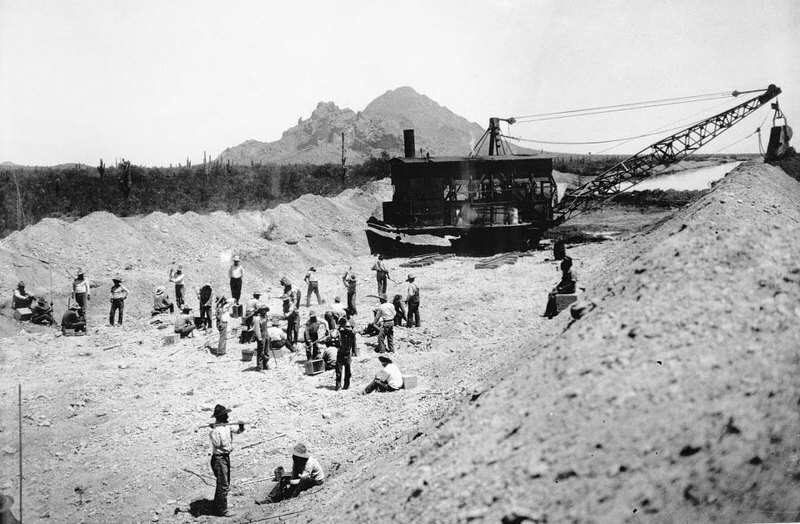 1930: The Granite Reef Dam was completed in 1908 for the Salt River Project. It replaced an older dam that washed out in a flood. The dam diverts most of the Salt River into the Arizona Canal and Eastern Canal for irrigation and drinking water in metro Phoenix. Image courtesy of Historic American Engineering Record, Library of Congress. ~ Source: Historic American Engineering Record, Library of Congress. 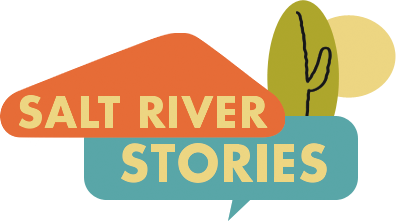 John Larsen Southard, Mark Tebeau, and Amy Long, “Watering the Desert,” Salt River Stories, accessed April 22, 2019, https://saltriverstories.org/items/show/45.